Included service: hygienic kit. Carriage: superior; a/c; bio toilets. Nevsky Express is one of the first Russian high-speed trains. It operates since 2001 and still stays one of the most convenient and fastest ways of moving between the two largest cities of Russia, St. Petersburg and Moscow. A good reputation of Nevsky Express train, which it earned during the years of operation, allows it to be a competitive alternative to the new high-speed train "Sapsan". Nevsky Express cruises year-round, daily (except for Saturdays from St. Petersburg, Sundays from Moscow) and runs without stops. The train consists of first and second class cars and a dining car. Most cars belong to the first class and consist of 6-seater compartments, arranged 3+3 face-to-face with a table between. The price includes meal. 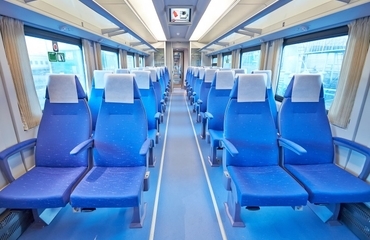 Some trains include also the second-class open-planned carriages with capacity of 68 seats. All cars are equipped with bio toilets and air conditioning. The restaurant car serves the passengers a wide range of hot dishes, snacks and drinks. Passengers can also order restaurant meals through a conductor with delivery to the compartment.